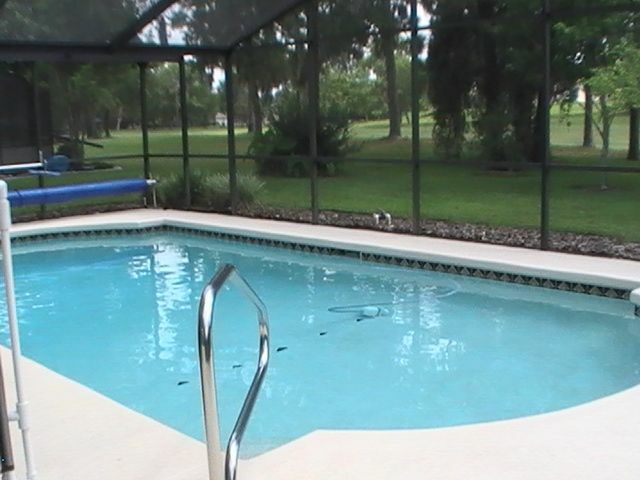 Enjoy our beautiful luxury pool & golf home located in the heart of Florida’s Gulf Coast! Overlooking the beautiful Oak Hills Golf Course, this home has all the amenities and a pristine private heated pool. Fully air conditioned for your comfort. You will find everything you need is provided. Oversize en-suite master bedroom with king size bed, sitting area,TV and double vanity bath. Second bedroom has a double-sized bed, and the third bedroom has two twin-sized beds. Top quality furnishings throughout for your comfort. Relax in the oversize great room with fireplace, CableTV & DVD. A wall of glass provides access to the screen enclosed pool and patio. A separate sitting room provides a quiet place for reading or conversation. A fully equipped kitchen with modern appliances plus a full laundry make your stay convenient. Activities and Attractions: Florida’s central gulf coast region is known as the Nature Coast. The area is a haven for wildlife of all types. Famous for numerous golf courses, excellent fishing, water sports, beaches, fine restaurants and shopping. It is a short drive to Weeki Wachee Springs, Buccaneer Bay Water Park, and the manatees at Homosassa Springs. Enjoy a picnic at the beach and the great sunsets at Pine Island which is only a 10 minute drive. Convenient to restaurants, cinema, bowling and shopping within 10 minutes driving. Located on Oak Hills Golf Course, an 18 hole 6935 yard par 72 championship course with a driving range, a pro shop, a well-maintained putting green and professional golf instruction. Vacation Rental Rates: Relax and enjoy Golf, Fishing, Boating and the Beaches. Our prices are reduced between April and December. Off season means less crowds and more relaxation. Bookings are 5 nights minimum with flexible check-in days. Price includes taxes and cleaning charges. A security deposit is required and is refundable after departure. Electric pool heat is available for an extra charge. Discounts available for multiple week and multiple month bookings. Value: We offer an exceptional value where you will get much more for your money than at any hotel or resort property. Our guests have told us they appreciate the comfortable at home atmosphere and excellent amenities. Cheryl and Bob currently live in Florida where Cheryl is a Doctor of Physical Therapy and Bob is a Biomedical Equipment Technologist. Our four adult children reside in New England. We have our home on the Oak Hills Golf Course in Spring Hill. We enjoy kayaking, beaches, surfing, fishing, boating and the great Florida weather. We really enjoy the Spring Hill area and the convenient access to the many things to do in the Tampa Bay area as well as easy access to the attractions in the Orlando area. We continue to find new adventures in Florida and we have made many close friends here. All of our friends and family that have come to visit us in our Spring Hill home have had wonderful experiences that they talk about over and over again. You will find that our vacation rental home is like your home away from home. A little bit of paradise with a private setting. Our guests have enjoyed sitting by the pool and watching and listening to the many birds. It is a peaceful setting but also convenient to stores and restaurants. Pine Island beach is a family friendly park directly on the Gulf of Mexico. Only 8 miles away. Only 8 miles to the Gulf of Mexico for swimming, boating, and fishing. Located directly on the Oak Hills Golf course. View the golf course from the rear of the house as you enjoy the outdoor patio. Initial supply of spices coffee, tea, paper towels, trash bags, dish detergent. Complete dinnerware set with utensils. Plasticware for use poolside. Tennis rackets are provided to use at public tennis courts. Many golf courses nearby. The house is on the seventh tee of Oak Hills Golf Course. Large southerly facing pool with child safety fence. Pool toys and floats are provided. Optional Pool Heat is available. This Spring Hill home was excellent. Spacious, well decorated, comfortable, and located near everything that interested us. We stayed from Jan. 1st to March 31st and loved it. The lanai and pool were facing South so we were able to be out using them every day!! The owner , Bob, made us feel welcome and insured that all was well for us. Many U.S. veteran posts were close by , as were great restaurants and good shopping. You will enjoy this home if you rent it!! !WE sure did.!!! This home has been kept up and very well cared for. We had never used Home Away so We didn’t know what to expect from this experience. When we walked in, the home was spacious with a great layout for our family to have conversations and not be on top of each other. It felt like we were at a family members home. It was conveniently stocked with anything we needed to make meals, play games, or use the beautiful and clean pool. The most important thing to me was a clean place for my family and this home was spotless and well cared for. We would definitely stay again. Two couples rented this lovely, well-kepted and comfy home in Spring Hill for 5 nights. We were visiting family in the area and the minimum stay of 5 nights fit our timeframe. The beds were comfortable, the kitchen was stocked with spices, dinnerware, cookware and modern appliances; the tea room was conducive to morning reading, and sitting poolside was the focal area for us. We felt right at home. The pool was delightful and the large assortment of boardgames was great! We really enjoyed our stay and hope to return next year for our Florida youngsters' music contests. Thank you for sharing your home with us! We are glad you enjoyed your stay. We try to make our home as comfortable as your own and provide the little extras that make a difference. We look forward to seeing you in the future. Nice home, convenient location, I hope to ren't again! We are glad we met your expectations. We look forward to seeing you again on a future visit to Florida. The home had everything we expected and needed. We loved the quiet area and location of the property. We used the pool everyday and enjoyed that the 16th fairway was in the background. We would stay here again if we return to the area. Spring Hill is the perfect base for the avid golfer. With over 50 golf courses within a 25 mile radius you will find several courses to challenge your skills. Many of these are public courses so you can play a different course each day. If you love nature you will find that Spring Hill is conveniently located in the heart of Florida's nature coast. Many areas are nearby where you can observe a variety of wildlife. A paddle down the pristine spring fed Weeki Wachi river in a canoe or kayak will bring you close to many birds and small animals. You can also observe the Manatee, dolphins, and other sea life in their natural habitat. For an interesting experience, take an air boat tour through the coastal flats and mangrove forests. You will see many birds and aquatic life that is not accessible with normal boats. MInimum stay is 5 nights. $85 cleaning fee for rentals of 10 days or less. No cleaning fee for rentals longer than 10 days. Optional Weekly pool heating fee is $85 - Available October through May.